We began a new liturgical year on Dec. 2, the First Sunday of Advent. This is a sacred time – a new beginning – filled with rituals and symbol inviting us on a journey to prepare our hearts and lives for the presence of God among us. The Advent wreath symbolizes this new beginning for us. The circle of the wreath reminds us of God’s eternity and endless mercy, which has no beginning or end. The green of the wreath speaks of the hope that we have in God, the hope of newness, of renewal, of eternal life. Each Sunday, we light a candle on our Advent Wreath. The four candles represent the four weeks of Advent. The purple candles symbolize the prayer, penance, and goods works undertaken at this time. The rose candle is lit on the third Sunday, Gaudete Sunday – a day of rejoicing because the faithful have arrived at the midpoint of Advent when our preparation is now half over and we are close to Christmas. The candle symbolizes the light of God coming into the world through the birth of Jesus. By using the symbolic power of candles, we illustrate that Advent is a time of solemn preparation, that during this time, we are awaiting the Light of the World and the Dawning of Hope. By prayer– The weekday and Sunday Masses will help us in the challenge toward renewal: through its Scripture readings, the words to the hymns, in ritual, in the content of the prayers, in the liturgy's inwardness and restraint. We began with a wonderful University Advent Liturgy on Dec. 2, followed by a candlelight procession and lighting of the University Christmas Tree on the Dionne Green. The Royal Signers led us in the signing and singing of “Silent Night” after members of the Jesuit Community blessed the tree. A complete list of worship services is available on the Campus Ministries web site. 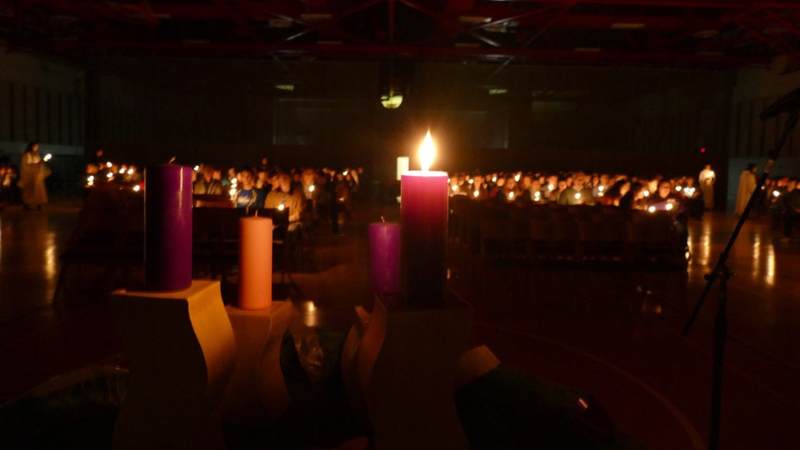 By penance– A student leadership team prepared an Advent Reconciliation Service on December 4. The theme, “Let Go of Your Stone,” led students to reflect on those things that impedes one’s relationship with God. When returning to God conscious of our sins with a desire to ask for forgiveness, we are enabled to heal the pain caused by our sin and begin anew in our relationships with others and with God. What a wonderful way to prepare once again to celebrate the birth of Christ! If you missed the service, members of our Jesuit Community will hear your confession through Dec. 21 - Monday through Wednesday, Friday, and Saturday at 11:30 a.m., as well as on Tuesday from 6:30-8:30 p.m. in Sacred Heart Chapel. By goods works– University community members have purchased Christmas gifts as part of our annual Christmas Giving Tree These gifts will be distributed by Catholic Social Services and Friends of the Poor during their Toy Giveaway program for local Scranton community members who are in need. Others have participated in the Adopt-a-Family Program with the Catherine McAuley Center, which provides temporary shelter to women and children in crisis. Still, others can spend a few hours on Christmas morning volunteering at our 10thAnnual Community Christmas Day Breakfast. We are expecting over 500 local residents to join us, many of whom are alone. You can still take part in these service activities. For more information, please contact Campus Ministries’ Center for Service and Social Justice: ellen.judge@scranton.edu, (570) 941-7429. Advent invites us to renewal - to receive comfort and hope in the deep of winter and be immersed in the eternal unchanging nature of God. By acts of prayer, penance, and good works, may each of us be drawn into the mystery and wonder of Advent. Come, Lord Jesus! Read daily devotionals by members of our University community here.